In February 2010 Parallel Foundation in co-operation with Platan Gallery launched Art with a view, a new series aims to excite artistic imagination and give room to creative energies. Artists are not invited to make an evening performance, but to try new forms and formats, to be adventurous and experiment with a non-theatrical space. The conceived actions and performances not only relate to the site and to the unique setting of the gallery on Andrássy Street, but also to the host institution, the Polish Cultural Institute, as each artist is asked to make a Polish connection, in any playful or abstract way they wish. For the public Art with a view is an exciting encounter with a choreographer or a theatre maker, often shedding new light on their artistic work. 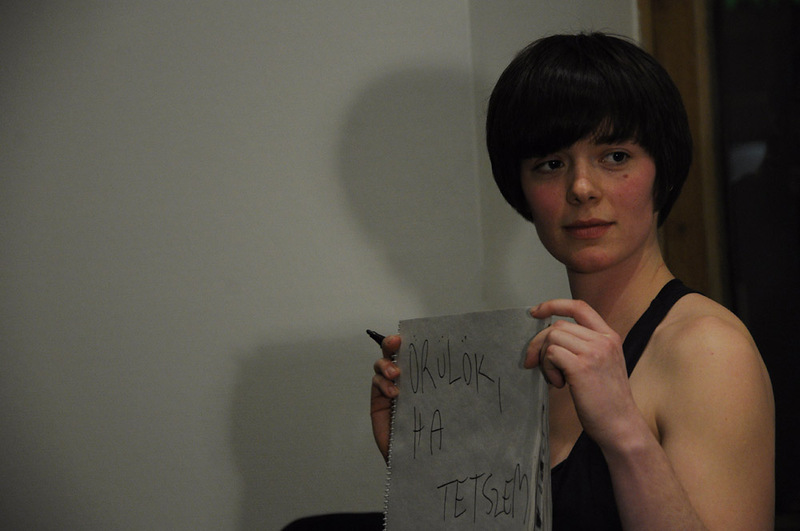 Hodworks was established in 2007 by Adrienn Hód. Alongside permanent creative members, artists are also invited to co-operate with this international contemporary troupe. It is a creative group that is based on independent artistic creativity with great degree of concentration and a sensitive and provocatively fresh approach. At the centre of their work is a body free of all obstacles, intermediaries, decorations, props, and theatrical devices. Performances are always headed in an unknown, new, progressive direction. One consistent quality is a virtuosic language of movement established and refined through many hours of experimental work. The main tool of the rehearsal process is improvisation, which they re-invent in performance within a carefully planned structure. Choreographic structures are marked by a delicate teeter from abstract presentation to specific meaning and back. A Hodworks performance dilates the senses and thespirit of the audience; it tempts them, but is never aggressive. It causes one to question and to doubt. It does not compromise. It does not aim to please. Previous Post Urban adventures 1. Next Post Art with a View 2.